The humble grilled cheese sandwich. Looks can be deceiving though. One of the sandwiches pictured is quite ingenious. 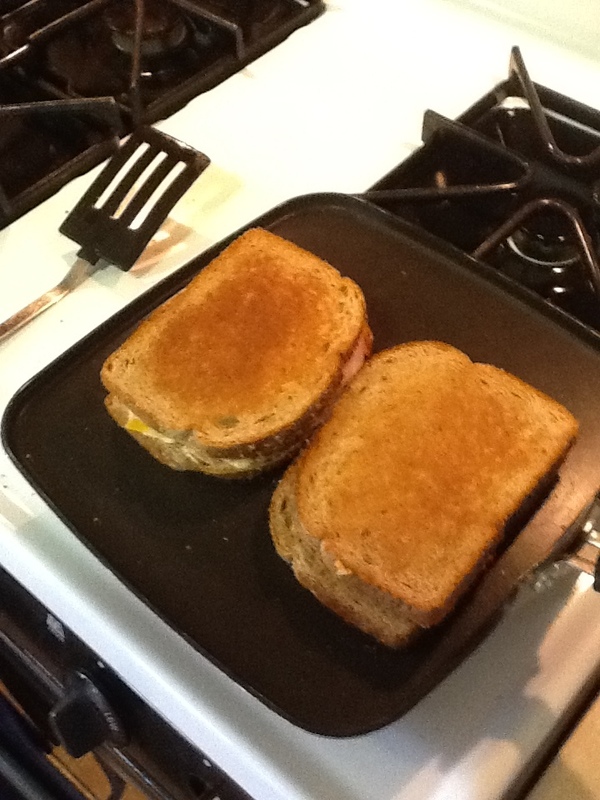 The other…well the other is a plain, boring simple sliced cheese on two pieces of buttered bread for my son. He is on his way, yet he still has much to learn. For some people this is simply a comfort food. It reminds them of lunches while growing up. Throw in a bowl of tomato soup and they will be in heaven. For me, not so much. Especially the tomato soup thing. I don’t really get that. Although, one time I attended this high end wedding reception at some swanky place in The Loop in downtown Chicago. One of the hors devours was these little grilled cheese sandwiches with a little bowl of tomato soup. It was very tasty, just not my idea of comforting. The grilled cheese can be so much more. For instance, my sandwich pictured above has mayo with chipotle seasoning, deli slices of roast turkey, and colby jack cheese. Delicious with a little kick to it. There are so many variations to the grilled cheese. In a way, the grilled cheese is like a pizza. You can put almost anything you like in there. In fact, the pizza grilled cheese is one of my son’s favorites. Layer up between the bread sauce, mozzarella cheese, and toppings. Use whatever toppings you want: sausage, pepperoni, olives, etc. Sprinkle some pizza seasonings to enhance the flavor. Sprinkle pizza seasonings on the butter. Another nice addition is to stick Parmesan cheese to the butter. I should note a couple of things here. First, when creating these grilled monstrosities, it is a good idea to alternate layers of cheese with the layers of non-melting ingredients. That way when the cheese melts, it’ll all stick together. Second, it takes longer, but low heat is a good idea. That way everything melts and sticks together. This will make flipping the sandwich easier. Another sandwich that I love, while technically not a grilled cheese, is incredibly delicious and easy to make. First, you grill two slices of bread with butter and Parmesan on them. When golden brown, take them off the griddle. Then layer up sprouts, tomato slices, and avocado slices. Eat. Try not to make too many yummy noises. Recently I received my utility bill and it looked a little funny. It’s been a mild month, and I know I haven’t run the heat or A/C all that much. My wife likes to bake, but she doesn’t bake THAT much. Yet, the bill looks like something from the middle of the summer or the middle of the winter when I’ve running full-out cooling or heating. So, how do I verify what the utility company is telling me? What it boils down to is I need to check my meters and make sure that the utility company has read my meters correctly. Not too difficult. In this case, the meter is very easy to read with a digital readout. 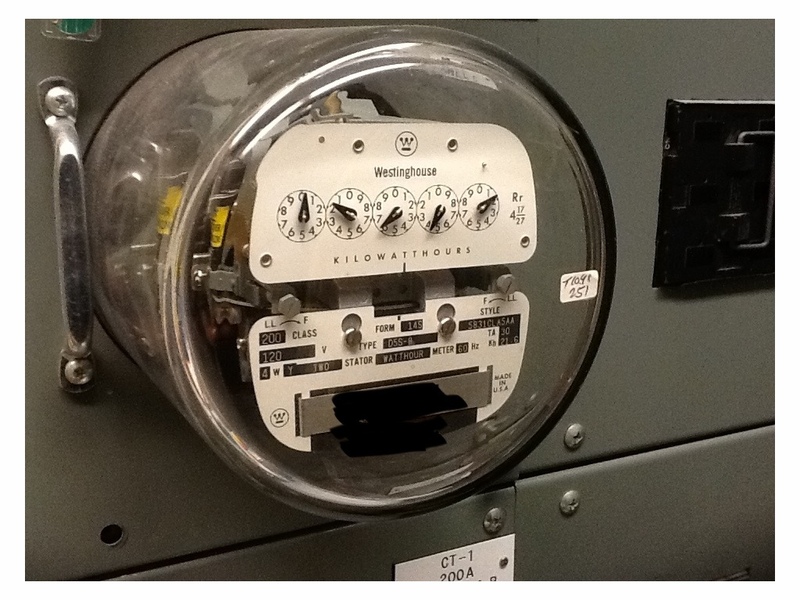 The utility company can probably remote read your meter, so there shouldn’t be errors in the meter readings. 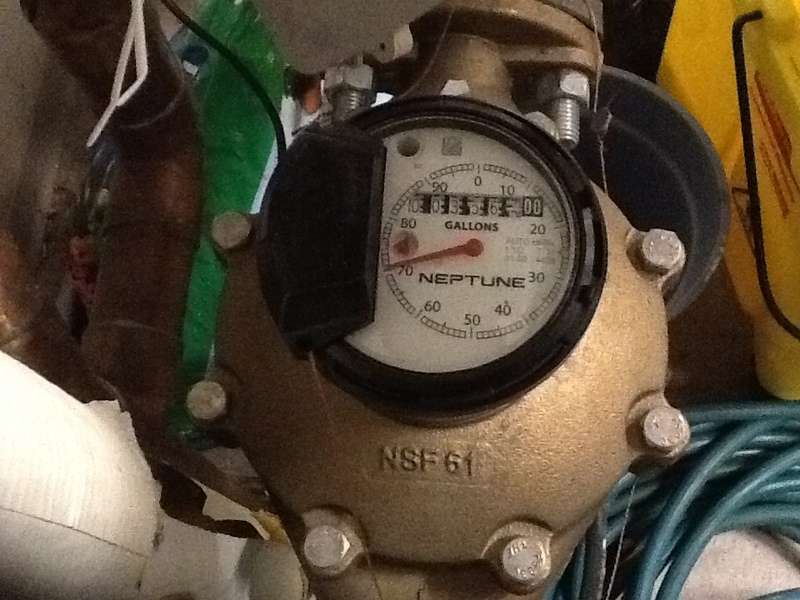 Strangely enough, many water utilities seem to have figured out that meter reading accuracy is important. Below is the water meter at my work. The meter in my home is smaller, yet the exact same kind. The little black box sitting just to the left of the dial enables a remote, digital reading from a truck in the street. In addition to that, the dial is incredibly easy to read for any lay-person to check their readings. Again, because of the remote, digital readings, there shouldn’t be errors in the reading. I’ll have to admit. Even I’m confused at times and write down the wrong numbers when looking at one of these meters. This is one of those cases where form follows function. Mechanically, the dials on these types of meters are incredibly simple. Behind the face there are just a series of interlocking gears with 10:1 ratios. So, as the dial on the far right turns around once clockwise, the dial just to the left makes a 1/10th turn counterclockwise. Each dial rotates in the opposite direction of the one adjacent to it. First is the dial rotation direction. The first time reading the meter above, you might look at the second dial from the right and, thinking like a clock, see it as just past the 5. Not so fast! It is just past the 4. The second and trickier hangup is when the dial is right on a number. Looking at the meter above, you see the 4th dial from the right is very close to the 2. It is pretty obvious on this meter, that the dial has not quite reached the two, however. You can also confirm this by looking at the dial just to the right. That dial is between the 6 and 7, so you know that 4th dial is still approaching the 2. As that meter gets closer to 2000 kWh, the 4th dial will get closer and closer to the 2. 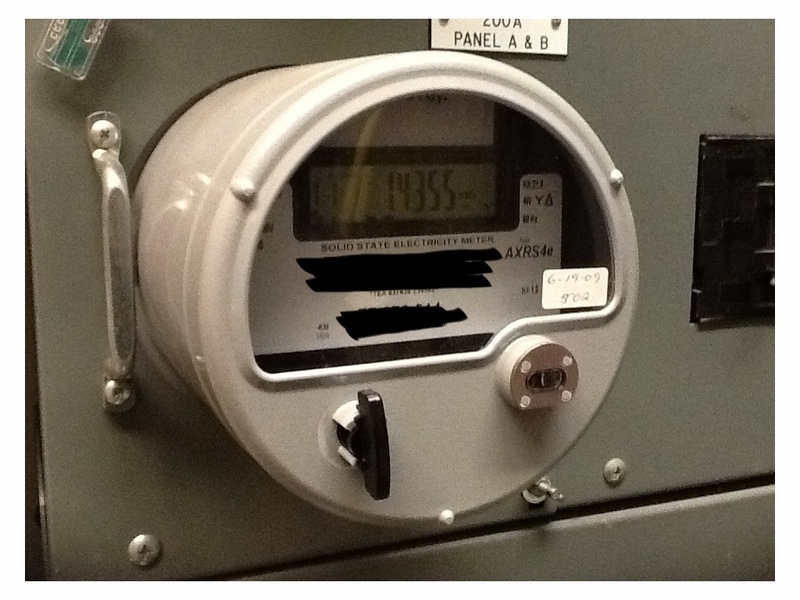 When the meter is reading 1,999 kWh, it will be very easy, with a quick glance to believe the meter is saying 2,999 kWh. It is important with this sort of meter to confirm if the dial is still approaching a number or just past a number by checking the dials just to the right. Anyone want to venture what the correct reading of the electric meter above is? 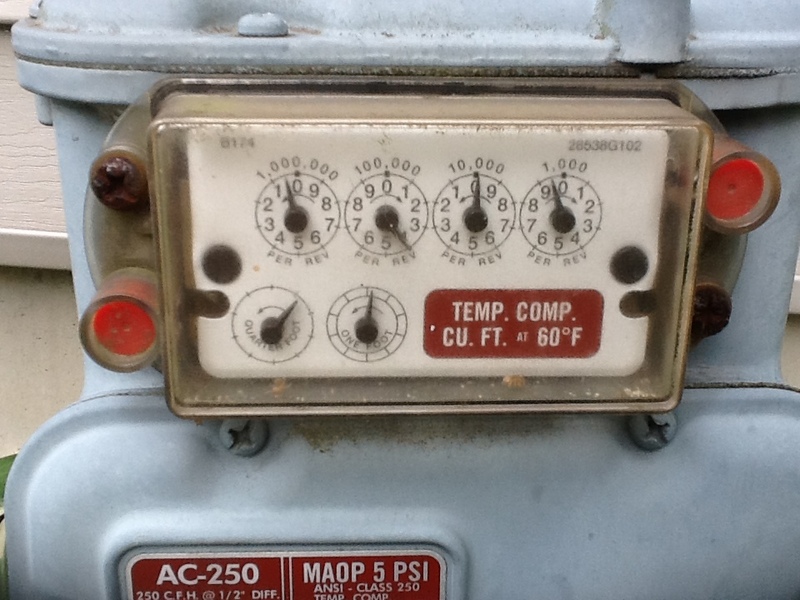 Quiz time: Below is a gas meter with a very similar dial arrangement. I’ll send a Milky Way candy bar (my favorite) to the first person who gives me the correct reading with the correct units. The answer will be different than you think. Anyone know why? Let me start by describing our in office review process. Typically we do 30%, 60%, and 100% review sets. These are the “official” sets that we send over to the Architect. Between these design iterations there are any number of intermediate reviews. My boss would ask: “Louis, print me off a ceiling plan.” “Louis, print me off the ductwork plan.” “Louis, print me off a boiler room plan.” “Louis, print me off a piping plan.” It was unbelievable how much paper we went through. And not just 8.5×11 printer paper. This was 30″ and 36″ wide format paper on our laser plotter. The paper is expensive and the plotter is not cheap to maintain. Also, I should mention that we save many of the mark-ups. If the mark-ups include minor revisions, those would get recycled. However, major design decisions would get saved. We have a large room in the back of the office filled with these mark-ups in addition to the final plan sets. It started with my boss doing a demo of BlueBeam’s PDF Revu software. A few days later I got a set of marked up plans…as a PDF! So, I had to download the BlueBeam demo and try it out. His mark-ups didn’t look pretty. He actually used a mouse to free hand his notes. However, over the year, he has gotten much better marking up the plans and using the text tools. Now he uses marked-up PDF’s for everything: review sets for projects, schematic “napkin” plans to clients, spec reviews, etc. It is nice because now we no longer have stacks of bed sheet sized pieces of paper lying around. Instead we have project directories on the network with PDF records of plan mark-ups, “print-outs” of load calculations, selections from vendors, etc. PDF’s have streamlined the construction side of the projects as well. We now get many of the equipment submittals from contractors as PDF’s. Instead of marking up six hard copies and overnighting a large (heavy) box of submittals back to the architect, we now mark up one PDF and e-mail it back. Then came the iPad. I had never wanted one. I had never needed one. They looked like, well, a toy. An expensive toy that I could never justify ever getting unless the price was drastically lower. That was the view of pretty much everyone within the office. I did not like Apple’s proprietaryness. I’m a big fan of open design. One early adopter from the electrical side got an Android tablet. He was less than impressed. When the iPads first arrived in the office, they sat, for the most part, collecting dust. The people who did use them used them for checking e-mail, updating Facebook, playing games, and nothing productivity enhancing. The first thing I started using was Evernote. I found this nice for personal notes and some general knowlege documentation. But with our PDF archives already on the network directory, I didn’t find using the iPad for this incredibly useful. 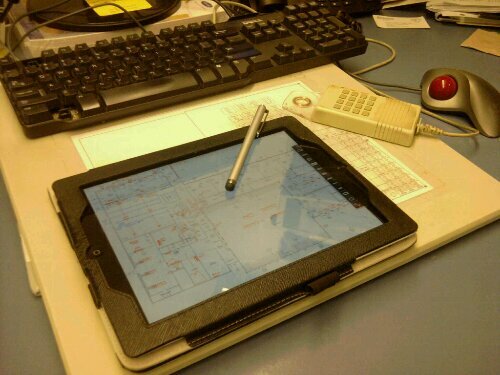 One time I tried using Autodesk’s AutocadWS app to mark up actual CAD drawings while out in the field. This was crude and did not work very well. Overall, the iPad as a productivity tool had been a bust. After a few months Joe, my coworker, bought a stylus. “Why would I need THAT?” I had originally asked myself, they are expensive and there is no handwriting recognition (ah, remember the Newton?). He came back from a field visit with a marked-up set of field notes that he had used the stylus with. It was brilliant. Not only did he save the trouble of carrying around a stack of full size plans, he also now had an electronic record of his field visit. The field notes were no longer a crudely marked-up, dust smudged 11×17 or 36×48 sheet of paper that was worth more than it’s weight in gold. They could be saved to our PDF archive and anyone could look at them whenever they wanted to (instead of having to frantically look for them two days before a project was due). That was the dawn of a new age for us in our office. Dropbox – This has been essential for transferring files back and forth between our desktop computers and the iPads. As a side benefit it has aided with making work more portable in general. Gotta work on a file at home? Drop it in the Dropbox folder. Not that I like taking work home all the time, but hey, sick kids happen. Box is a similar app. At the time when I used it, it did not have the desktop syncing folder like Dropbox. GoodReader – Originally I was looking for a free way to mark up PDF’s on the iPad. AutocadWS is a way, but it doesn’t work every well. At $4.99, GoodReader is worth EVERY penny. The key is that it handles large drawings with ease. This seems to be the general consensus in other reviews. PDF Expert is another app people mention, but I haven not played with this one given it’s $9.99 price. Notability – This is another app ($0.99) that allows you to mark up PDF’s. This app is more suited for taking hand written notes such as a call log, project notes, sermon notes, etc. I essentially use it as a note pad. This app is nice because it has a magnifier and wrist rest. These features were added to GoodReader later; I’m just used to using Notability. Note Taker HD is a similar app with similar features for $4.99. My coworker Joe uses Note Taker. Stylus – Without the stylus marking up PDF’s does not work very well. I’m a cheap Dutchman, so, I really balked at spending $15 to $20 for something I could do with my finger. The iPad was designed with fingers in mind after all, right? Anyway, Joe bought the stylus, I saw how it worked out for him, tried his out, then went out and bought one the next day. (Bonus, I found mine on sale!) If you’re still on the fence about a stylus, I just saw some very inexpensive ones at Walgreens the other day. Try it out, then go get something of a little better quality. Don’t bother trying to make the ones on Instructables. Once these ingredients were in place, the iPad has become indispensable as a tool here at work. Please share your own experiences using a tablet computer. Has anyone had this sort of success with an Android tablet? What Should an Engineer Ask? Once a month a factory representative or vendor is going to come by and give you good reason to break your diet by ordering pizza and give you a dog and pony show. (If this is not happening, your vendors and equipment reps are not doing their job and developing a robust relationship with you.) The vendors are going to show you the latest line they’ve just acquired, the newest product their multinational conglomerate just introduced, or sometimes update you on the products they already have. Every time at one of these things it seems like we have a liteny of questions that me and my associates will run through. Not all of these apply to every piece of equipment that you will be specifying, but these should be helpful in many cases. Are there any installations in this area? There are several reasons for asking this question. If this is a new piece of equipment, you may want to see a real live installation (not that we really have time to do this). Also, you want to know has the rep dealt with this equipment. Does it work well in your particular climate zone. How long has this product been in production? What support will you get from the rep? Regardless of what product they selling, will they be there on that -10 F when the school makes that “we have no heat” call? This can only be proven over time. If the rep is new to us, show some commitment by visiting us on a semi-regular basis. Become familiar with our products. Take an interest in our specs. What support does the factory give? Will the manufacturer go out of it’s way when there is a problem? Will there be factory representatives present at startup? Will warranties be honored? How long has the rep represented this manufacturer? Did they just pick up this line or have they represented it for the last 15 years? What has been their experience with this manufacturer? What sort of problems have there been? This is a good test of the honesty and how much of a straight shooter the rep is. Will you get spin or a straightforward, honest answer (i.e. “we had this problem and this is how we solved it”). What products would you say are equals? Again, this is a good test of what kind of sales rep you are dealing with. In this case, it helps if you know of items that may be equals. There are several possible answers to this question. The rep may spin the answer and say that there are no equals. Or, he may provide you with “equals” that are way beyond the quality, specification, and budget of what you are seeking. So, if you specify the reps equipment along with the “equals” he gave you, he is guaranteed to get the bid because the “equals” will be so much more expensive. Equals are important because it keeps the playing field competitive. When you have three similar products of similar quality you can verify, it will only help the owner get a better deal. It keeps the rep’s pricing of their equipment realistic. How is the equipment controlled? This is more specific to my line of work. As things become more computerized and interconnected, this will become more and more relevant for everyone. You need to ask: What control language does it speak? BacNet, Lon, other? What is the add for a different protocol? Many times equipment will speak one protocol natively and then there is an add-on card that needs to be provided for the equipment to speak something else. In years past this could be an expensive add-on. Due to building contol systems becoming more of a commodity, it seems that these add-on boards are becoming less of an issue. What are the control limitations? It’s all just software, right? Apparently there can still be limitations in things such as control sequences and the like. This will probably be the topic of another post. The short version of the story is that to achieve the ideal control sequence we wanted for economizer operation on a unit ventilator required a $1000 add-on controller. The existing controller only had very specific, limited set-points and sequences. Finally, what I have listed above here are all questions about the specific piece of equipment. However, the interaction between the sales rep / consultant is so much more than just the equipment specification and sales transaction. We want to develop a relationship with the sales rep. This partly goes back to the start-up and operation support. We want to know that the sales rep and factory are going to be there and that we can talk to them when things go wrong. A big part of this is developing a rapport between the sales rep and the consultant. So, asking how are the wife and kids, how was your weekend, and what’s your handicap are not out-of-bounds. In fact, they are necessary. Now it is your turn, do you have any favorite questions that you like to ask your factor reps and vendors? Have you been in a Kohl’s lately getting a great deal on that sundress or those pants on the clearance rack? Have you paid attention to the announcements? Chances are you probably heard something about the store you were in being either LEED or Energy Star certified. Now, why would Kohl’s go though the effort of getting Energy Star? Just because it looks good? People buy more expensive energy star appliances over standard efficiency equipment. Wouldn’t you rather shop in a store that cares about energy over a store that doesn’t? Maybe that works in hippy places like California. I think, first and foremost, it is because they are reducing energy cost. This helps them give you best possible deal on the latest fashions, right? That’s a win. A bonus from this is that through Energy Star they get marketable recognition of their natural profit preserving activities. Positive marking appeal. Another win. How does Energy Star for buildings work? It is pretty simple really. Basically, you enter in the past year’s worth of energy bills for your building and then check how your building performs against other similar buildings. If your building is better than 75% of the building stock in the same class, then your building qualifies for Energy Star. Now, the question is, what is your building really being compaired against? Energy Star’s infomation is based on the Commercial Building Energy Consumption Survey (CBECS). This survey catalogs the energy consumption, location, internal loads, occupancy, etc. of about 5,000 buildings. The survey is conducted every 4 years by the Energy Information Administration. The last survey should have been done in 2011. Due to funding cuts, however, this survey was not completed. There was a survey done in 2007. However, there were statistical problems with the data and that survey was scrapped. This leaves us with the 2003 survey being the last viable data for the Energy Star rating. So, the last 10 years of improvements in equipment, lighting, envelope, energy codes are not accounted for in the survey. By making small improvements in your building over the current energy codes, with current equipment, you can easily get that blue sticker on your building. The Energy Star label for buildings is starting to become diluted and meaningless. It is not encouraging innovation or competition any more. More importantly,the CBECS is also a policy tool. Law-makers need up-to-date and accurate information for making decisions on energy policy and building codes. Politicians don’t run campaigns based on 10 year old survey data. Neither should we do the same with our energy policies. The good news, CBECS is back! They are finalizing details on the 2012 survey. Budget-willing, data should be collected in 2013 and results published in 2014. Given the current economic and budgetary climate, this could always reverse. Organizations such as ASHRAE, USGBC, and others have been diligently advising lawmakers to budget for the CBECS. Please write your congressional leaders and let them know the importance of this (relatively cheap) tool. It costs only $4 million per year to maintain the CBECS. This should be a no brainer on both sides of the aisle. For the Reds, it doesn’t pick specific winners or losers in the market. It only encourages innovation and competition. For the Blues, it encourages using less energy which is good for the environment. 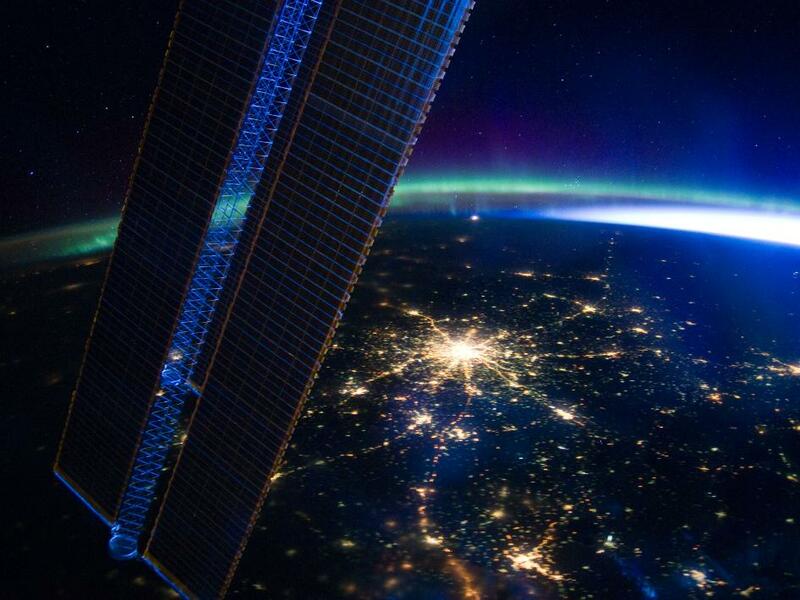 For all of us, it encourages less energy use which ultimately means lower dependence on foreign energy sources. I remember once, while camping on the Oregon Coast when I was younger. 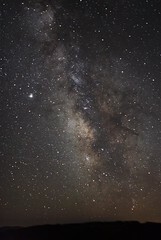 I had to get up in the middle of the night and I was blown away by all the stars I could see. Being common city folk, I had never seen that many stars at once. I had a similar experience to this when I was older. Again, I was out camping. This time it was at the base of Mt. St. Helen’s just after my senior year in high school. We camped there the night before climbing to the summit of the volcano. That night again I had to get up. The combination of the rarefied air at higher altitude, lack of city lights, and no moon gave me a mind bogglingly incredible view of the stars. The thing about looking at the stars, you start to think about how incredibly small we are in this universe. We are specks on a speck going around a speck that goes around a larger speck full of specks and there are billions of those large specks. Yet…then you look at the man’s accomplishments. Though we are small specks on a much larger speck we have made a huge impact on our speck. We have spread across it. We have leaped off it. There isn’t a portion of our speck that has felt our impact from the bottoms of the oceans to tops of the highest mountains. We can and have impacted all of the Earth. It is as if we are meant to have this power to transform this speck. We haven’t done a great job taking care of our speck. Our bad habits are starting to crowd us out. I take courage from our impact, however. Though we have huge momentum to overcome, we can turn things around. These little ants can change things for the better.